How and why did I wait so long to start this trilogy? It has been patiently (and seductively) waiting upon my shelf and I have finally joined the dark side. The Sin Eater’s Daughter is absolutely glorious. Twylla is Daunen Embodied, poison runs through her blood making her deadly to the touch. She knows a life of murder and isolation. Betrothed to the Prince, Twylla can see only one future for herself until Lief arrives and with him comes possibilities. 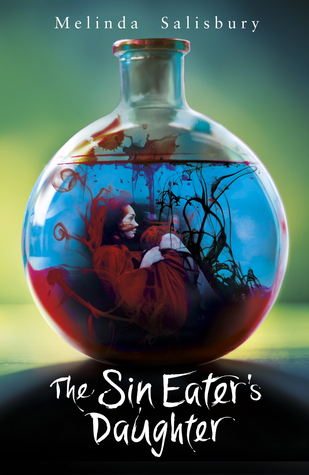 The Sin Eater’s Daughter is the first book in a trilogy but something that I really liked about this book was the way in which it felt like it had its own fully formed plot. Although the seeds are planted for later plot concepts in the trilogy, Melinda Salisbury does a great job at answering a lot of the questions that arise during this book and in this sense it felt like a fully fledged novel, rather than just an introduction to the series. I absolutely adore the world that Salisbury has created, there is just so much to love about it. I love when a fantasy novel provides me with a fully formed world and particularly enjoyed learning about the mythology of this new world. It was also interesting to learn about things such as the Telling and the Eating. Melinda Salisbury describes them in such a real way that I almost forgot that these are things that do not happen in real life. This book is GLORIOUSLY evil and dark and twisty – I live for these things in my fantasy books and Salisbury nailed it for me! This world has evil and darkness running through its core. Whether it be the eating of sins, the poisons and many deaths or the characters, there was something deliciously dark about this book. Okay, let us talk about the characters. I already LOVE Twylla and I love to read a character that is so well-rounded. She is everything: strong, badass, independent, adorable but also vulnerable and I just loved her. I just really wanted to wrap her up in a fluffy blanket and give her a good old Welsh cwtch and protect her from all evil. I think that I could love Merek but I am not completely sure yet! Lief causes me ISSUES because my head and my heart are SO conflicted as to how I should feel about him, which in its own way is a sign of Salisbury’s excellent writing as I’m sure I feel exactly how Twylla does! The Queen may be one of the most terrifying characters I’ve read in a long time. She is evil through and through and I’m not sure that I will ever feel less scared of her. From the very beginning of this book I found myself worried for Twylla whenever the Queen was around. She is cold, manipulative and heartless. Terrifying but a fantastic antagonist nonetheless. I have fallen in love with Melinda Salisbury’s writing style. She managed to create a whole world and background without having huge chunks of information dumping paragraphs. Her writing style is informative and descriptive, giving the reader everything they need to emerge themselves in the world. I loved the way I was able to really feel that I was on this journey with Twylla. The ending of this book certainly packed its punch – did not see that coming!! You’re spot on with the Queen, she was definitely terrifying! YES!! Like honestly it was everything I love about a fantasy book and the trilogy just gets better and better!! I think this book was really well written. I still have to read the sequel! I agree, I really enjoyed her writing style. I flew through the trilogy and it’s amazing! Yay! I’m so glad you’ve added it to your TBR! It’s a fab read!